Self-Healing energies flow in and out of your body. We don’t just live on the Earth. We live inside a cavity between the Earth’s surface and ionosphere. The ionosphere is the ionised part of Earth’s upper atmosphere, from about 60 km to 1,000 km altitude which influences the link between the Schumann Resonance and the human brain. There are also five other atmospheric layers surrounding us, and our planet earth; they include the mesosphere, troposphere, stratosphere, thermosphere, and exosphere. And within that space, we live with invisible energies and oscillating fields. The smallest changes in one intertwined area carry over turbulence into others. Quantum physics proves to us that we are 100% energy, light, sound and resonance from the energy vibrations. I intend to discover what this means in Self-Healing. This article is stage one in understanding the basics of energy all around and in us. The Schumann Resonance results in Earth’s natural heartbeat rhythm, which is the global electromagnetic resonances in the cavity formed between the Earth and the ionosphere which is about 50 kilometres above the earth’s surface. It historically has a measurable frequency of 7.83 Hz, but in 2019 it has peaked by twenty times this normal rhythm on various days. How does that affect us? This ionosphere-atmospheric layer conducts electricity. The ionosphere creates energetic particles from sunlight and objects from outer space that drop in every day and burn up. Every second, a multitude of pulses travel around the world in this unique, resonant chamber between the Earth and the ionosphere, sending signals to all microorganisms. These signals couple us to the Earth’s magnetic field and have a direct link to our brain. The various layers surrounding the earth have their own frequencies and affect one another, thus affecting us. Pulsating energy fields surround the Human Body. The aura is the electromagnetic field that surrounds the human body no matter where he is in the Universe. The aura of a human is called the “Human Energy Field” and is a collection of electromagnetic energies of varying densities that permeate through and emit or exit from the physical body of a living person. These particles of energy are suspended around the healthy human body in an oval-shaped field. This auric field surrounds the body approximately 2-3 feet on all sides and extends above the head and below the feet into the ground. My intention is not to educate you on energy fields surrounding the earth nor the human body, but to make my point, I have to mention them. Seven levels or energy bodies make up the complete auric field around the physical body. Each of these seven layers has a unique frequency and are inter-related. They affect the whole person on every level of being — emotional, physical, mental, and spiritual. They are inherently interconnected, and therefore, a state of ill-health in one of the bodies leads to a state of ill-health in the others. The physical body is a tangible form with the lowest frequency. The seven auric bodies begin with the “etheric body” with higher frequency rates. The level of frequency determines the vibration rate and wavelength. The longer the wavelength, the lower the vibration frequency. We can easily understand frequencies which we can hear, see and feel on a day to day basis, but not the ones that are beyond our senses like those surrounding our body, our aura. Each higher frequency produces colour and sound which is recorded with the appropriate device or camera. Our Spiritual and Earth Connections. The Physical Body is at the lowest vibrational level and is dense in atomic structure. It addresses physical sensations and is the most tangible in our consciousness or awareness. We are aware of our body, its movements, sickness, ageing, and death in the here and now. The Etheric Body is the next higher vibrational level. It addresses the relationship between the physical body to the higher bodies. The energy of this body flows through the meridians and pathways that transmit the spiritual life force energy through the physical body. This body of energy is connected to our 1st “RED” Energy Centre which communicates with our reproductive glands and associated systems like testes, kidneys and spine. The Emotional Body addresses feelings and emotions and is connected to our past stored emotions along with our 2nd “Orange” Energy Centre which regulates our adrenal glands, certain aspects of the immune system, metabolism and associated organs like bladder, prostate, ovaries, kidneys, gall bladder, bowel and spleen. The Mental Body teaches us self-knowledge, self-healing and reflects the conscious mind, logic, current thinking, and intellect. It is associated with our “ego” and relates to our 3rd “Yellow” Energy Centre which communicates with the pancreas; also regulates metabolism and other organs like Intestines, liver, bladder, stomach, and upper spine. The Astral Body is the bridge between the physical planes and the spiritual planes. It is associated with the 4th “Green” energy centre and is linked to the thymus gland and regulates aspects of the immune system, heart and lungs. The Devine Will Body is the place for the present and all possible futures. It relates to the 5th “Blue” energy centre and is linked to the thyroid gland, regulates body temperature, bronchial tubes, vocal cords, respiratory system, all areas of the mouth, including tongue and oesophagus. The Celestial Body works on the intuitive level and mirrors the subconscious mind that is in the inactive part of our brains. It is associated with the “higher” emotional aspects of spirit. It is the place of knowing universal love and the divinity in all things. It relates to the 6th “Purple” Energy Centre and is linked to the pituitary gland, helps produce hormones and governs the function of five glands, eyes and brain. The Causal Body vibrates at the highest frequency and is the place where the soul communicates with the conscious mind via the subconscious mind in the mental body. It is the place of universal consciousness and connection to the “universal all”. This body reflects all the experiences and events of the soul. It relates to the 7th “White” Energy Centre and is linked to the pineal gland, regulates biological cycles, including sleep, spinal cord and the brain stem. The Soul energy links outside of the physical body through the first spiritual consciousness centre which I call the 8th “Gold” Energy Centre and is located above your head. If you’ve ever seen paintings depicting holy figures with circles of golden light around their heads, you’ve seen a visual representation of the love and light that flows from higher energy centres. It is the energy centre of divine love, of spiritual compassion and spiritual selflessness. When the eighth Energy Centre begins to open and expand, a new spiritual awareness begins to take shape. The individual starts to sense themselves as part of a larger community of people. This energy centre is the gateway to “out-of-the-box” ideas, concepts and abilities. This centre enables the individual to achieve spiritual perception, spiritual wisdom and offer selfless service to the world’s people. The Christ Energy also links outside of the physical body through the second spiritual consciousness centre called the 9th “translucent white” Energy Centre which sits about four feet above the head. The Christ abilities lie dormant within this energy field, waiting to be released and used in the outer and inner worlds. The shift in focus is toward that Christ energy and the accompanying abilities and the effects on your health that go along with it. The Solar Star Energy links through the 10th “Sapphire” Energy Centre which is connected to the thalamus in the brain. This energy field is responsible for divine creativity and the synchronicity of life. Divine creativity is the ability to create all facets of your life in perfect harmony. When this harmony starts to manifest, the individual’s life just “clicks” and moves forward effortlessly. It will seem as if this person is always in the right place at the right time. Divine energy is flowing through the brain and into the individual, bringing perfection into health and everything he does. This is where we get mind over matter theory. The Spiritual Library Energy links through the 11th “Rose-Light” Energy Centre and I have no idea where it is located. In that library are the total contents that you will need to operate as a human and divine being. The Eleventh Energy Centre contains the energy connections necessary for the individual to manifest advanced spiritual skills like travel beyond the limits of time and space, teleportation, bi-location, telekinesis and instantaneous precipitation of thoughts into matter. The Ascension Energies links to the 12th “Multi-Coloured” Energy Centre which is the source of the individual’s strength and power and his ability to create change not only in the physical dimension but the nonphysical dimensions as well. This energy centre plays the key role in ascension (passing over/death) by dropping off the physical body in a split second and replacing it with an energy body in the Astral plane designed like your auric energy body. 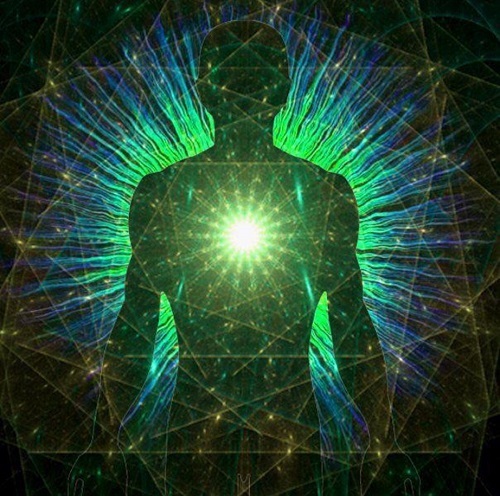 the energies coming in through our energy centres from outside our body. These facts influence and includes all aspects of our lives, not just our physical health. We are more than just a body with bodily functions. Our health is more than being free of disease. The function of the Energy Centres is for external communication with the entire body via biological systems, such as the endocrine glands and nervous system. Which Comes First – the egg or the chicken? I have no idea. I started with the lowest of the lowest aspects of physical health, the body’s acidity and inflammation. I moved on to the microbiome, small and then large intestine functionality. I cleaned up my body of harmful bacteria, ensured I ate what my body needed by growing it myself, and then acted against the main “door-closer” to health up to that point – mental and emotional stress. I’ve recorded in detail my health recovery through blogs and articles on my website. I’ve started to record videos of the process which will also be on my site. I am now starting to understand subtler energies and the effects they have on every aspect of my being – spiritual, mind, brain and body. Join me on my weekly email journey where I share the detail of my recovery from many diseases like diabetes, arthritis and painful legs and feet. Click here to join my weekly emails and watch a short video on discovering your health direction via your body’s resonance.